This book is unique in describing the history of post war reconstruction from an entirely new perspective by focusing on the changing relationship between architects and building workers. It considers individual, as well as collective, interactions with technical change and in doing so brings together, for the first time, an extraordinary range of sources including technical archives, oral history and visual material to describe the construction process both during and in the decades after the war. It focuses on the social aspects of production and the changes in working life for architects and building workers with increasing industrialization, in particular analysing the effect on the building process of introducing dimensionally co-ordinated components. Both architects and building workers have been accused of creating a built environment now popularly discredited: architects responsible for poor design and building workers for poor workmanship. However, many of the structures and ideas underpinning this period of rapid change were revolutionary in their commitment to a complete transformation of the building process. An Architecture of Parts adds to the growing literature on changes in the building world during and immediately after the Second World War. 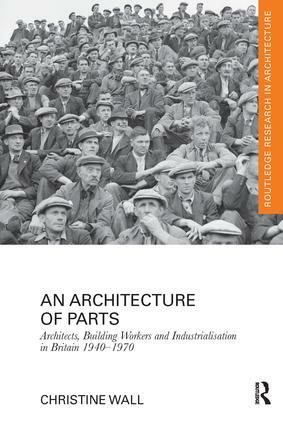 It is significant, both empirically and historically, in its examination of the ideas, technology and relationships that fired industrialization of the building process in mid-century Britain.